The NT133-3 temperature controller is simple, and easy to operate but still provides a wealth of capabilities in a complete package for temperature control of high voltage and medium voltage oil cooled transformers. The NT133-3 can monitor temperature, drive the cooling fans and calculate a thermal image of the 3 transformer windings using an exclusive algorithm. The NT133-3 comes with 1 double RTD Pt100 input for a redundant control and 3 universal inputs for current transformers (CT). Output relays are available for ALARM, TRIP, and FAN for driving the cooling system. 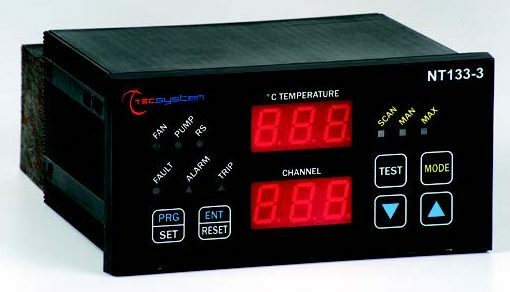 It also contains an output for PUMP control and a fault indication relay for signaling a sensor problem or a self diagnostic fault within the controller. A digital Modbus 485 output allows for remote control.